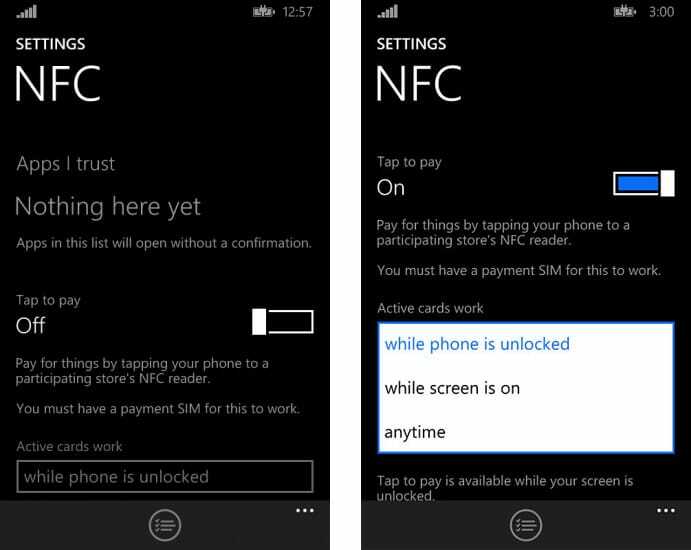 Windows Phone 8.1 will increase the level of control users have over NFC payment cards provisioned to their NFC SIM when it ships in mid-2014, according to a series of leaked screenshots, as well as provide a way for users to speed up NFC tag interaction times. Users will be able to switch “tap to pay” on or off completely as well as choose whether they wish NFC payments to be available “anytime”, “while screen is on” or only “while phone is unlocked”. Users “must have a payment SIM for this to work”, the screenshots reveal. By selecting certain apps that involve tag reading as “Apps I trust”, users will also be able to avoid the need to confirm that they want to open the app requested by a particular tag when it is scanned. Other apps will continue to require tacit approval by the user between reading a tag and executing the app, as a security measure.